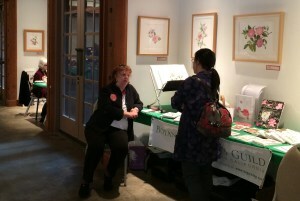 Gilly Shaeffer demonstrating her watercolor technique. Gilly Shaeffer demonstrating her watercolor technique. Photo credit: Brad King (SCCS President). In January of 2015 BAGSC staged a show entitled A Passion for Camellias in Van de Kamp Hall at Descanso Gardens. The exhibit was an exciting addition to the first Camellia flower show of the 2015 show season. BAGSC members were on hand all that weekend to answer questions and to provide demonstrations. 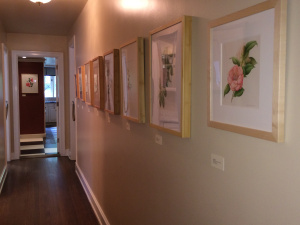 At the request of Descanso Gardens, 11 art works from the initial display of 20 have been re-hung in the historic and beautifully restored Boddy House where they are expected to remain well into 2016. Art works were selected to represent as many contributing artists as possible. The area where the botanicals are hanging invites close observation, along the interior hallway leading to and spilling into the kitchen. 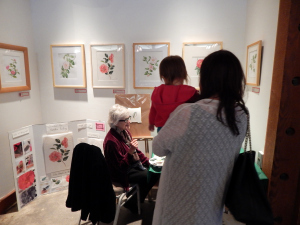 Artist Tania Norris chatting with Camellia enthusiast Hiromi Sato. Many thanks to David Brown, Susan Armstrong and Cris Martinez of Descanso Gardens for welcoming BAGSC’s Passion for Camellias to the Boddy House. 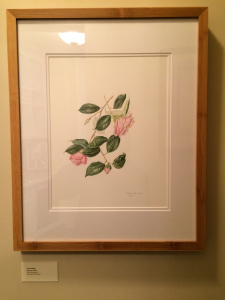 Watercolor of C. japonica ‘Berenice Boddy’ by Clara Josephs, © 2015, all rights reserved. Camellia Botanicals in Descanso’s Boddy House.